Why are blood creatinine levels checked? What are normal blood creatinine levels? What are considered high creatinine levels? What are the symptoms associated with high creatinine levels? What causes elevated (high) creatinine levels in the blood? Who has low or high blood creatinine levels? The kidneys maintain the blood creatinine in a normal range. Creatinine has been found to be a fairly reliable indicator of kidney function. Elevated creatinine level signifies impaired kidney function or kidney disease. As the kidneys become impaired for any reason, the creatinine level in the blood will rise due to poor clearance of creatinine by the kidneys. Abnormally high levels of creatinine thus warn of possible malfunction or failure of the kidneys. It is for this reason that standard blood tests routinely check the amount of creatinine in the blood. A more precise measure of the kidney function can be estimated by calculating how much creatinine is cleared from the body by the kidneys. This is referred to as creatinine clearance and it estimates the rate of filtration by kidneys (glomerular filtration rate, or GFR). The creatinine clearance can be measured in two ways. It can be calculated (estimated) by a formula using serum (blood) creatinine level, patient's weight, and age. The formula is 140 minus the patient's age in years times their weight in kilograms (times 0.85 for women), divided by 72 times the serum creatinine level in mg/dL. Creatinine clearance can also be more directly measured by collecting a 24-hour urine sample and then drawing a blood sample. The creatinine levels in both urine and blood are determined and compared. Normal creatinine clearance for healthy women is 88-128 mL/min. and 97 to 137 mL/min. in males (normal levels may vary slightly between labs). Recently, elevated creatinine levels in infants were associated with bacteremia while elevated levels in adult males have been linked to incresed risk of prostate cancer. Early kidney disease is a silent problem, like high blood pressure, and does not have any symptoms. People may have CKD but not know it because they do not feel sick. A person's glomerular filtration rate (GFR) is a measure of how well the kidneys are filtering wastes from the blood. GFR is estimated from a routine measurement of creatinine in the blood. The result is called the estimated GFR (eGFR). 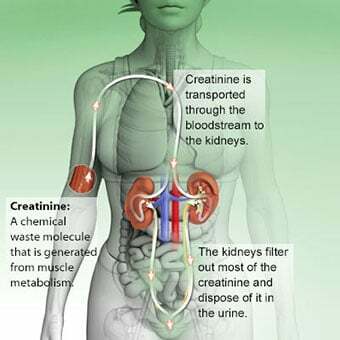 Creatinine is a waste product formed by the normal breakdown of muscle cells. Healthy kidneys take creatinine out of the blood and put it into the urine to leave the body. When the kidneys are not working well, creatinine builds up in the blood. A person with only one kidney may have a normal level of about 1.8 or 1.9. Creatinine levels that reach 2.0 or more in babies and 5.0 or more in adults may indicate severe kidney impairment. The need for a dialysis machine to remove wastes from the blood is based upon several considerations including the BUN, creatinine level, the potassium level and how much fluid the patient is retaining. The symptoms of kidney dysfunction (renal insufficiency) vary widely. They generally do not correlate with the level of creatinine in the blood. 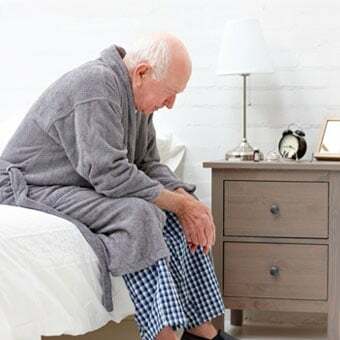 Some people may have an incidental finding of severe kidney disease and elevated creatinine on routine blood work without having any symptoms. many other nonspecific symptoms (for example, nausea, vomiting, neuropathy, and dry skin). Any condition that impairs the function of the kidneys is likely to raise the creatinine level in the blood. It is important to recognize whether the process leading to kidney dysfunction (kidney failure, azotemia) is longstanding or recent. Recent elevations may be more easily treated and reversed. Certain drugs (for example,cimetidine [Bactrim]) can sometimes cause abnormally elevated creatinine levels. Serum creatinine can also transiently increase after ingestion of a large amount of dietary meat; thus,nutrition can sometimes play a role in creatinine measurement. Kidney infections,rhabdomyolysis (abnormal muscle breakdown) and urinary tract obstruction may also elevate creatinine levels. Muscular young or middle-aged adults may have more creatinine in their blood than the norm for the general population. Elderly persons may have less creatinine in their blood than the norm. Infants have normal levels of about 0.2 or more, depending on their muscle development. 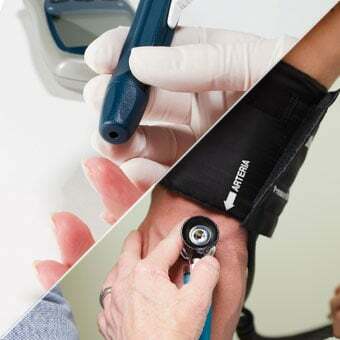 In people with malnutrition, severe weight loss, and long standing illnesses, the muscle mass tends to diminish over time and, therefore, their creatinine level may be lower than expected for their age. Why did your health care professional want to check your creatinine levels? 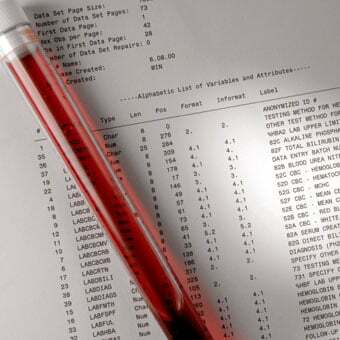 Were your creatinine blood test results higher than normal levels? If so, what was the diagnosis and what action was taken to lower the creatinine levels? Please describe your experience with high or low creatinine blood levels. What symptoms did you experience with elevated blood creatinine levels? Dialysis is a procedure that performs many of the normal duties of the kidneys, like filtering waste products from the blood, when the kidneys no longer work adequately. There are two types of dialysis: Hemodialysis uses a filter to remove waste products and water from the body; and peritoneal dialysis removes excess waste and fluid with a fluid that is placed into the patient's stomach cavity through a special plastic tube. The most common method used to treat advanced and permanent kidney failure is hemodialysis. Hemodialysis allows your blood to flow through a special filter that removes extra fluids and waste products. Most patients have treatments three times a week. Tests to measure treatment success are performed about once a month. Anemia, erythropoietin, renal osteodystrophy, itching, sleep disorders, and amyloidosis are all complications from dialysis. A proper diet can help improve dialysis and daily health.